You’re looking for something that you and your children can do together, but you’re not thinking board games or Xbox. You’d prefer something that gets you guys outside enjoying the fresh air and your surroundings. Well we’ve got just what the doctor ordered...you might not have ever thought of this because we hadn’t either until a few trips to our local park. Wait for it....Scooters! Yes scooters are a great way to get outside and enjoy, you know, something other than the couch for once. Riding scooters are fun a lot easier than bikes and a lot more versatile. Something you probably never knew about scooters is that they serve as a serious mobility booster for kids. Kids who ride scooters at younger ages develop better depth perception and balance than those that don’t. Are you a dad who wants you son or daughter to be good at sports? Then scooter riding could be the first step in that direction that will get your kid off on the right track. Another thing we love about scooters is that parents can do them too. Many companies develop models for kids and adults alike so the whole family can get in on the action. In our family we are always looking for ways to spend more time together with our hectic schedules and scooting along has proved to be fun and enjoyable for us. What Kind of Scooter is Good for Kids? Now that you are convinced that a scooter is the right choice for your little one you need to know which one to buy. For younger kids just learning to balance, the 3 wheeled models are preferable. This design allows for the rider to solely focus on learning to kick and steer. The stability and balance of the 3 wheeler makes it possible for tiny kids to scoot with adult and big kids. Micro and Globber offer solid packages at reasonable price points. What is the Best Scooter for Adults? 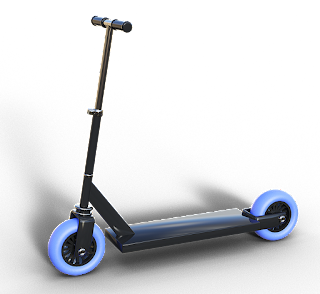 If you are a parent and are looking to join in on the scootering action, look towards grabbing a big wheel scooter. Not only will this type of scooter allow you to be faster than your little one in case you need to speed up to them, these scooters also do well for commuting in and around town. Maybe one day you can use it to cruise to work if you are a public transit user. Overall, opting to bring scooters into your family routine will be fun and rewarding. You’ll be getting out and exercising all the while enjoying quality to time. A much better alternative to the couch potato activities like PlayStation and Xbox. Your kids will thank you later! Disclosure: This is a contributed post.